NASA published a stunningly crisp image of Pine Island Glacier (PIG), Antarctica yesterday that is already out of date, because the PIG is on the move. Glaciers change rapidly these days and the speed of the PIG is anything but glacial. The image below from Nov.-13, 2011 shows a massive crack that will develop into an ice island about 3-4 times larger than the one formed from Petermann Glacier, Greenland in 2010. While the image indicates that the part seaward of the crack is still attached, I am convinced that it is already moving independently of the glacier. 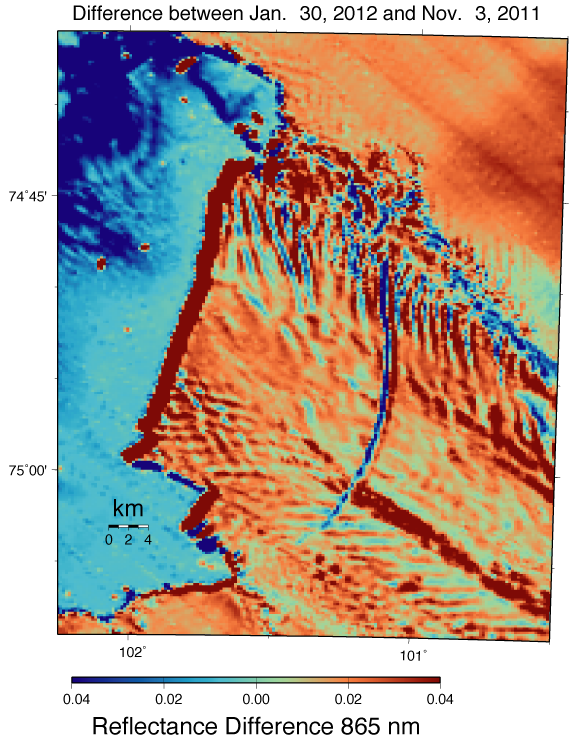 Nov.-13, 2011 image of Pine Island Glacier, Antarctica from the Advanced Spaceborne Thermal Emission and Reflection Radiometer (ASTER) instrument. Area shown cover 27 by 32 miles or 44 by 52 kilometers. Image Credit: NASA/GSFC/METI/ERSDAC/JAROS, and U.S./Japan ASTER Science Team. 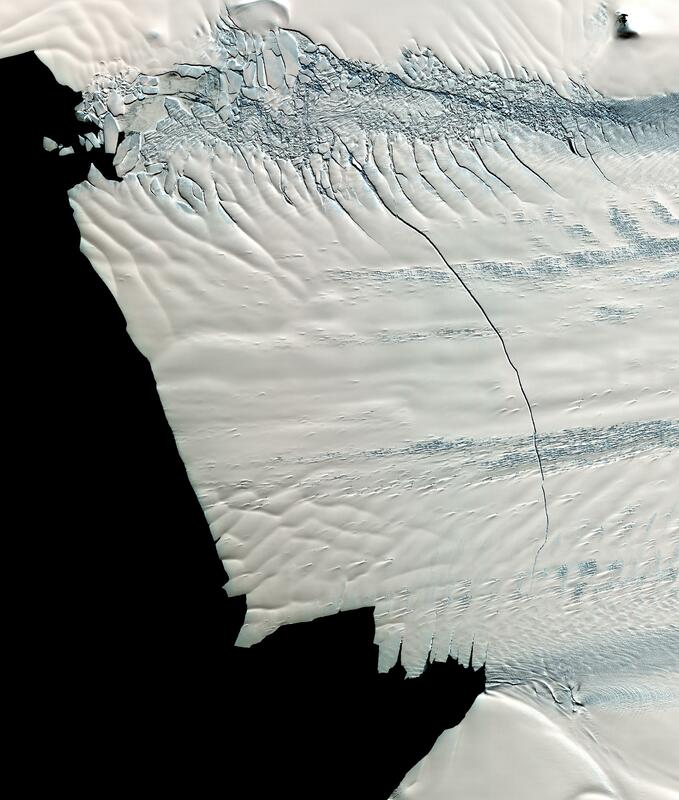 Pine Island Glacier, Antarctica as seen Jan.-30, 2012 from MODIS sensors on Terra spacecraft. The crack is visible as the white line. For reference I am also showing where the front of the glacier was seven years ago with a thin black line. The thick black line shows where the glacier is grounded to the bedrock more than 1000 meters deep (grounding line). Difference of two MODIS images, thick red line on left (seaward edge of glacier) shows the area that the new ice island had moved into on Jan.-30, 2012 that was water on Nov.-3, 2011. Lets leave the boring crack alone, nothing to worry there. What is important at Pine Island Glacier is the retreat of the grounding line, the location where ice, ocean, and bedrock meet. All ice located seaward of the grounding line is floating and does not add to rising global sea level. [Actually, it does raise sea level a tiny amount on account of subtle nonlinearity on how volume of water and ice are influenced by temperature, salinity, and pressure, but lets neglect this detail for now as everyone else does for a good reason). The problem with this process is that we cannot see it as easy from space, as we can see changes at the surface. The ocean melting does not give the stunning images that portray drama, concern, and excitement the same way that new ice islands do. Yet, for most large glaciers like Pine Island, Antarctic and Petermann, Greenland, the oceans are eroding and melting these glaciers from below. It is the physics on how this works that we scientists do not yet know and understand very well. It is one thing to have a theory and perhaps a model, but only hard data from the ice and the ocean will give us the confidence and understanding to make smart decisions that balance our energy use contributing to global warming with the need to economically develop. Smart development allows us to live better lives and cope with calamities, some of which may be caused by global warming and the sea level rise it brings. This entry was posted in Ice Island and tagged Antarctica, climate change, glaciers, Pine Island Glacier. Bookmark the permalink. It sure does and I am delighted that you shared it here. So perhaps we should look more closely at the MODIS channels 31 and 32? How well do you know that the thermal signatures actually correspond to plumes of freshwater other than local melt? The problems I see with ocean sea surface temperature (SST) estimates is that it is always hard to relate remotely sensed skin temperatures (fraction of a mm) to mixed layer temperatures (1-10 m) and then relate those to physical processes at 500 m depth in a salinity stratified ocean. Furthermore, SST from space is a very noisy measurement at the time and space scales that matter dynamically. Blowing the wind just a tad will potentially change the SST distribution dramatically. That image is Landsat TIR. We tie the thermal signature with sub-shelf melt-water thanks to in-situ oceanographic measurements taken shortly after that satellite image. More details in the (soon to be published) paper. And I agree, that image is mostly illustrative. 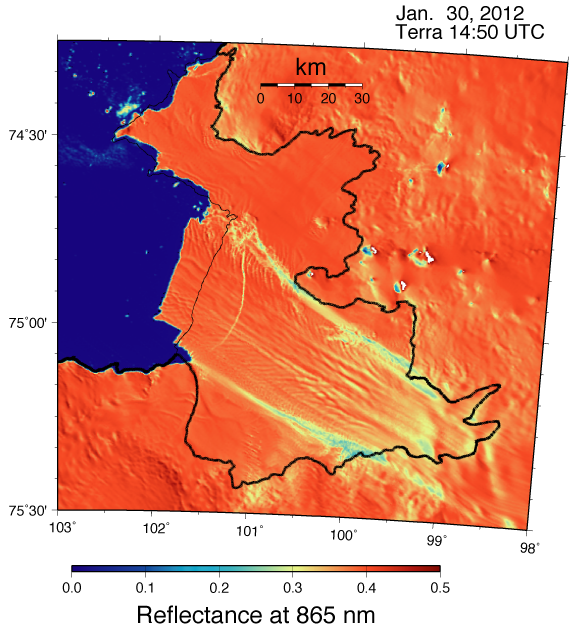 There is a connection to the mixed layer and sub-shelf waters hundreds of meters down and kilometers away, but not a strong quantitative one, and it only exists because of near-coincident in-situ measurements.